"We have an organist capable of stirring the soul." I am not a big fan of zombie flicks, so my initial reaction to the announcement of Criterion's Carnival Of Souls was less than enthusiastic. Having never seen the film previously, I was having a hard time justifying to myself why Criterion was going to the trouble of a dual disc set for this film. From the description this seemed like another one of those low budget black and white films that would put me to sleep. I ordered it anyway. To review Carnival Of Souls, one needs to look at its history, something this disc does exceptionally well. The film was produced by a pair of industrial movie makers, one Herk Harvey (director) and his writing partner John Clifford who worked for Lawrence, Kansas based Centron Films. Neither had ever worked on a feature film prior to Carnival Of Souls, nor would they ever do another one. Harvey came upon the idea for a feature after driving past the centerpiece of the film, a run down amusement park and ballroom on the shores of Salt Lake, and gave the description of the location to Clifford to work into a screenplay. They raised the money to fund the film over a weekend, and shot it in three weeks for a total of around $30,000. The film was theatrically released by a soon to be defunct distribution company, and only had a short run before the company went bankrupt. Years later Carnival Of Souls began resurfacing on late night TV, where it built a loyal following, and was resurrected with arthouse and festival showings over 20 years after its original release. The film opens with three girls getting into a drag race which ends tragically, as their car plunges off a bridge into the river below. Miraculously, three hours later only one survivor, Mary Henry (Candice Hilligos) emerges disoriented and confused. After the ordeal she decides to take a position as a church organist in Salt Lake City, and on the way there discovers the creepy remains of an old amusement park (Saltair). She also begins hallucinating, with an eerie face appearing to her (Herk Harvey-uncredited). To make matters worse, once she arrives at her new boarding house, she is greeted by her leering neighbor John Linden (Sidney Berger), who immediately goes on the prowl after poor Miss Henry. As she begins her new job, she finds herself increasingly drawn back to the amusement park, and as the film progresses the strangeness of her situation becomes more and more apparent. 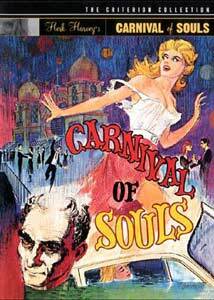 As I stated in the opening, this type of film usually has no attraction for me, but I began to get drawn into Carnival Of Souls from the get go. Candice Hilligos plays Mary with an eerie edge, you know something is not right about her. Sidney Berger is intensely annoying from his first line of dialog, as he does a superb job playing the lecherous neighbor—you hate him immediately! Director Herk Harvey cameos as the ghostly figure of Mary's hallucinations, and Gene Moore's haunting organ score perfectly suits the very disorienting mood the film creates. The cinematography is gorgeous, from the odd angle closeups, to the interplay of shadow and sunlight as Mary walks under a latticeway. Framing is used wonderfully, from expansive overhead shots of the pavillion to the claustrophibic two shots of John and Mary. The script is tight, the acting wonderful, but the best part of the film is the Saltair amusement park, which is just downright creepy. Although any number of films could have similar elements, it is Criterion's near flawless presentation of the film (both the 78 minute theatrical cut and 83 minute director's cut) that had my jaw dropping from the opening credits. Looking at this disc you would never know it was almost 40 years old. Image Transfer Review: I don't know what to say about this other than the image is near perfect. The number of major flaws in the source I could count on one hand. The black and white presentation is stunning, with great midtones, very fine grain and all around excellent contrast. You would never guess the age of the film by its look. Wow. Audio Transfer Review: Both versions of the film are presented in Dolby 1.0 mono, and it perfectly suits the feel of the film. The audio is well preserved, with a moderate amount of hiss. Dialogue is clear, and Gene Moore's organ score is full sounding, though not completely full range (though much better than the trailer soundtrack). There are some sync discrepancies with foley effects and dialogue, but these are in the source and add to the film's low budget feel—Herk Harvey comments on this in the commentary track of the director's cut. All things considered, audio is great. The Movie That Wouldn't Die! The Story Of Carnival Of Souls a documentary on the 1989 cast and crew reunion. Over 45 minutes of outtakes. An illustrated history of the Saltair resort. The Carnival Tour an update on locations used in the film. One hour of excerpts from films made by Centron Films. Extras Review: Criterion are renowned for their extras, with their jewel in the crown being the unparalleled Brazil. Although it may not unseat Gilliam's masterwork in the collection, Carnival Of Souls gives it serious company. A commentary track by screenwriter John Clifford and Herk Harvey accompanies the director's cut of the film (though it is sporadic and not very long—given that Harvey died in 1996, they had to use existing interview material for the commentary), and the disc also features over 45 minutes of cut scenes and alternate takes, accompanied by Gene Moore's complete organ soundtrack. However, unlike most special edition content which focuses only on the film itself, Criterion chose to also look into the people and places behind the film, and I think this is what gives this disc its true value. The Movie That Wouldn't Die! The Story Of Carnival Of Souls TV documentary is especially great to have to commemorate and immortalize the man behind the film, the late Herk Harvey. Here the cast gather for interviews 27 years after the film's release, and recollect the making of the film in an ensemble setting. We hear in Harvey's own words how the project came about, in the presence and with the participation of the cast and crew. This is a very nice addition to the disc. The illustrated history of Saltair is also a prize. This structure is one of the creepiest places I have ever seen, and its history is no less disturbing. Originally built by Mormons on the shores of the Great Salt Lake, we see the rise and fall of this building and grounds through an essay and series of historical photographs. If the movie didn't freak you out, this feature surely will. The disc also features over an hour of excerpts from Centron Films, the company for which Harvey and Clifford worked. Another superb addition, which gives a great overview of the kind of work Centron produced—a far cry from Carnival Of Souls. Harvey was a regular actor in many of these educational or industrial films. The subject matter is quite varied, from safety films to travelogues, and they give a very nice look at the era during which they were made. Highly interesting. We also get a produced for TV tour of many of the film's locations around Lawrence, Kansas, which takes us back to the Reuter organ company, the drag strip, the boarding house, the church and other locations used in the film (like where those dead people rise from the waters...). There are also printed interviews with Harvey, Clifford and Candice Hilligoss, supplemented by vintage photos and memorabilia. Menus are tasteful, with full motion images set to Gene Moore's organ soundtrack. This is an exceptional package filled with interesting and educational materials. Criterion has really done this late night classic justice! I can't rate this highly enough. I went into this with apprehension, and came out a fan. The film has been described as having the look of Bergman and the feel of Cocteau, and I would suggest that those who appreciate the art of film will find this as enjoyable as those who enjoy its horror content. This is a great film—it grows on you—and is also one of Criterion's finest performances to date. The set features two complete cuts of the film, plus a wealth of extras that, unlike some releases, really enhance the experience. The supplements are well thought out, highly informative and entertaining. This is one very special two disc set. Highly recommended.